1/16th scale GP truggy manufacturers,1/16th scale GP truggy exporters,1/16th scale GP truggy suppliers,1/16th scale GP truggy OEM service. 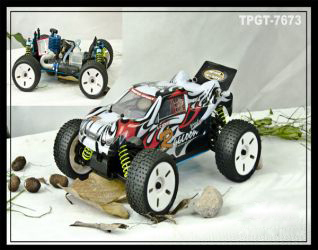 TECHINCAL PARAMETER: Vehicle length: 260mm Vehicle width: 210mm Vehicle height: 88mm Wheelbase: 174mm Gear radio: 1:12.1 Wheel width: 35mm Ground Clearance:20mm Wheel Diameter: 75mm Engine level: TaiWan SH 7cxp/AM FEATURES: 3.Solid universal joint cups/high performance ball bearings complete 4.Disc brake system with user replaceable pads provides quick brake response 5.45cc leak proof fuel tank with the overflow pipe and spring load fill cover for quick re-filling 7.Four body posts with many holes are suited for adjusting body height. 8.Four oil filled shock absorbers provide excellent shock protection.